For me, there is something lovely about working with flowers and greenery from around the garden, creating something beautiful and unique each time. There are no rules about which greenery or flowers to use in your flower crown, in fact, sometimes the best flowers to use are the ones hidden away or that you find in unusual places. Below is a list of what you will need and a few steps about how to make a whimsical and romantic flower crown. Once you’ve made your flower crown, place on your head, take your shoes off and frolick among the flowers. Once you have collected your flowers and greenery, store them in a jar of lukewarm water. Depending on the colour scheme you’re going for, or how big you want the crown to be, you can choose any kind of flowers. If you want to make a flower crown that will last for more than a few days, you can even use artificial flowers. Take two pieces of floral wire and shape them into one circle. This will form the base of the flower crown. Rest it on top of your head, adjusting the circle to be smaller or larger (ideally a loose crown around your head). Then simply twist the ends around one another to fasten the wires together. You can tape the circle with floral tape to ensure there are no sharp ends exposed. You will want to start your crown with a layer of greenery that covers the wire. We recommend using something you can twist around the wire base such as ivy or jasmine. You can add more clusters of greenery as well. 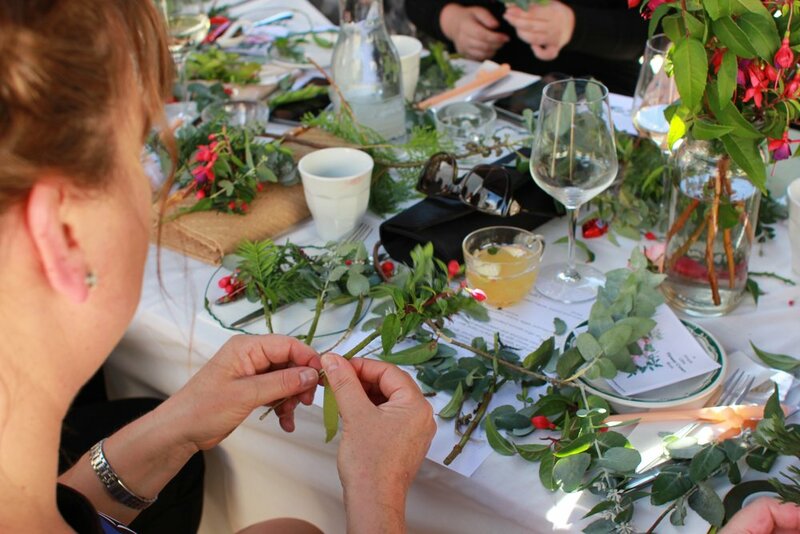 Strip lower stems of leaves and group pieces of greenery together and wrap with floral tape. Place your clusters of greenery and wrap with floral tape four to five times around your flower crown. It's important to make sure all your greenery clusters point in the one direction. Once you have the greenery taped to your crown it’s time to add your flowers. Now for the fun part - it is time to add your flowers! You can attach single flowers or small clusters. 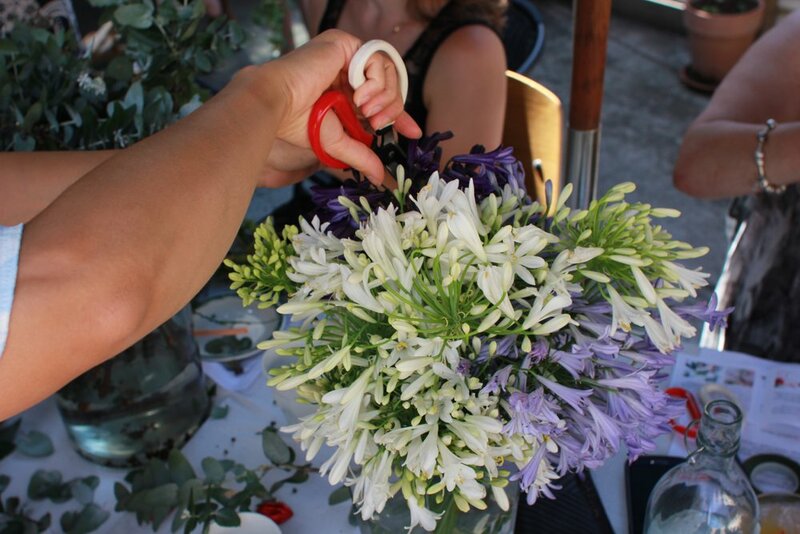 Make sure the flower stems are at least 4cm long (you can cut excess stems with scissors). Strip the lower stems of leaves. If creating flower clusters wrap them together tightly with floral tape prior to fixing to your crown (taping also seals the ends of the stems which stops flowers from drying prematurely). Now using floral tape, fix your flowers to your crown. Continue to add flowers until your flower crown is complete. Depending on your design you can add flowers to as much or as little of the rest of the crown as you like. Attach some singe buds or greenery if you end up with any gaps or spots of wire that need covering. And just like that you’re done! Place on your head and enjoy being a flower crown goddess for the rest of the day! Just be careful of the bees. 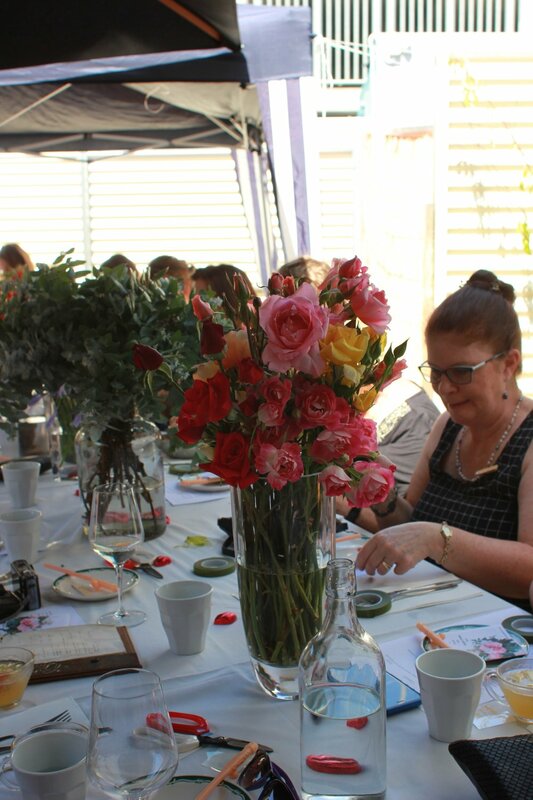 To book or enquire about a flower crown class just send me an email info@thesimplegesture.com.au. You can also find more information here. All photos by The Simple Gesture.